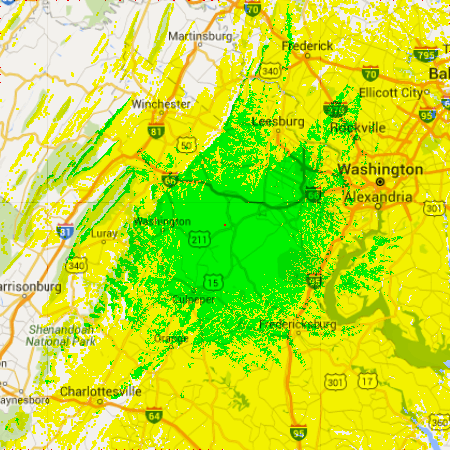 RF noise issues aside, the 6m band provides significant diffraction over hills and down into valleys. 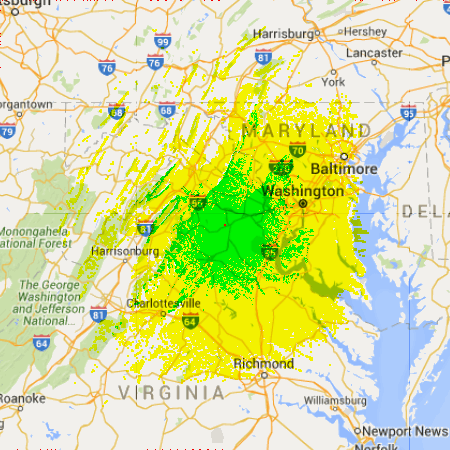 I’ve compared empirical and measured data enough times to suggest Radio Mobile models this propagation quite well. The diffraction effect is something I confirmed while volunteering for a horse endurance ride. The 2m band has this diffraction effect as well, but 6m proves to be the “magic band” for mountainous terrain. As you can see above, we’ve finally made it past the ridge line that blocks the higher frequencies. KYPN reports good coverage into nooks and crannies of terrain not otherwise conducive to VHF communications. Note as well the coverage has finally made it southward to Charlottesville, Virginia and the I-64 corridor. Here is a larger map. Terrain hugging diffraction is something I have witnessed, but whether or not 6m can really reach out this far in a regular fashion is anyone’s guess at the moment. Testing is paramount. In the hopes of maintaining some reasonable speed, the first role-out of the 6m port will be FM at 1200 bps. The fact so many modern HF rigs have 6m suggests the potential user base may need no additional equipment other than a sound card interface or traditional TNC. We envision only one 6m port on the VAPN.